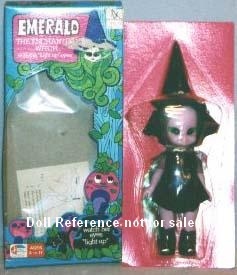 Girls World made the vintage Emerald the Enchanting Witch doll for Milton Bradley, Amesco Industries in 1972, she's about 6 1/2" tall, has green rooted hair, big green eyes, when you place an AA battery in her back, her eyes glow and flicker. Emerald the Enchanting Witch original outfit is a short black dress, pointed black hat with a purple flower and tall black boots. 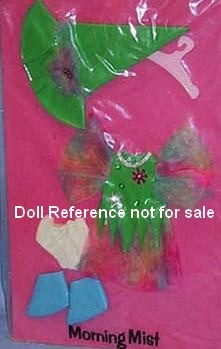 She has long green hair and green "glowing" eyes and is made of all vinyl. Emerald's separate outfits were; Bewitched, Gypsy Spell, Midnight Ride, Morning Mist, Nightgown and Saucy Sprite. accessories and a piece to Nightgown. 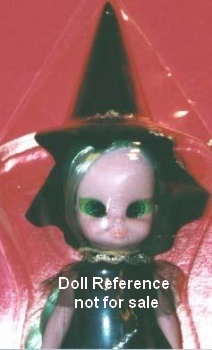 Additional Emerald Witch accessories were a magic crystal ball and magic cauldron, also a black and pink vinyl haunted house and a witch mobile or dragon car, this is quite cool as the car also has parts that light up.